Dukes Kitchens have a dedicated team of Trade Consultants for the supply of kitchen carcasses and complete kitchens to the Kitchen Trade. We operate throughout the UK & Ireland from our premises in Counties Donegal & Derry-Londonderry, Northern Ireland. All carcasses and complete kitchens are delivered to the requested location by a courier service. We work on a 10 - 15 working day lead time except on Bespoke or Paint to Order Kitchens which may take longer. Our top quality strong kitchen carcasses and wardrobe carcasses are extremely keen on price to ensure that your installation stays within budget. 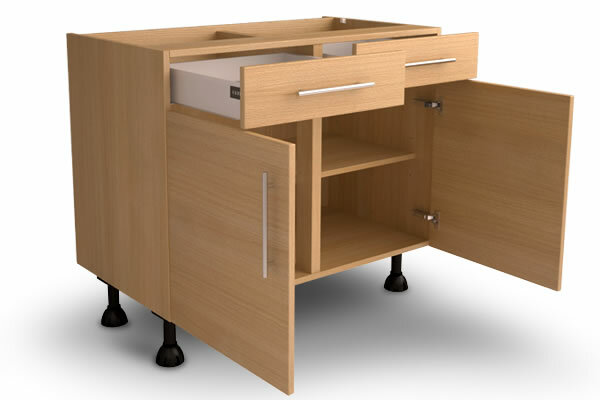 Soft-close Blumotion (soft-close) hinges and drawers as standard. We have an extensive range of finishes which provide an excellent match for all doors. Colour swatches of the various finishes are available. BELOW ARE A FEW EXAMPLES OF OUR TRADE PRICES BASED ON AN AVERAGE 12 UNIT KITCHEN SUPPLIED BY DUKES KITCHENS. £ 2,375.00 including LeMans II & Delivery. ﻿£ 2300.00 including LeMans II & Delivery. £ 2,750.00 including LeMans II & Delivery.